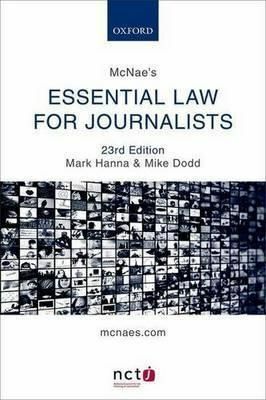 Description: Precise and lucid in its treatment of practical detail, McNae's Essential Law for Journalists is the unrivalled handbook for students of journalism and professionals. Including pithy summaries, clear cross-references, and hands-on practical advice, McNae's meets the needs of busy journalists who need quick and reliable answers to the questions they face in their day-to-day work, while also providing students with authoritative coverage of key media law topics. Published in partnership with the National Council for the Training of Journalists as the elemental text for students and widely used in newsrooms across the UK, McNae's continues to successfully distil the law and make it manageable. A comprehensive website (www.mcnaes.com) accompanies the text, providing a range of resources, including regular updates from the authors to keep you abreast of the law, whether on the job or in exams.